Climbing La Concha from Istan is hard work, but is it fun and the view from the top makes it well worth the effort. At 1200 meters above sea level, the mountain of La Concha is one of Marbella's most recognized landmarks with its chiseled shape and deep grooves. The hike starts in Istan, right next to the water treatment facility. If this is your first attempt, we recommend you coordinate the trip with an experienced guide to make sure your group enjoys a fun and safe hike. Check out the official La Concha t-shirt if you're looking for a unique gift for the Marbella enthusiast. Delivery is available straight to your doorstep or send this fun piece of Marbella to a friend or family member this holiday season. As you can see in the video, the path starts out from Istan and winds along a circuitous path through brush in the mountain valleys. Toward the ridge line, the path changes to more rocky terrain, which is an easier climb. The path is not easily recognisable, so it's best to go in the early part of the day. There are also excellent guides that are inexpensive and that make sure you reach the summit safely. 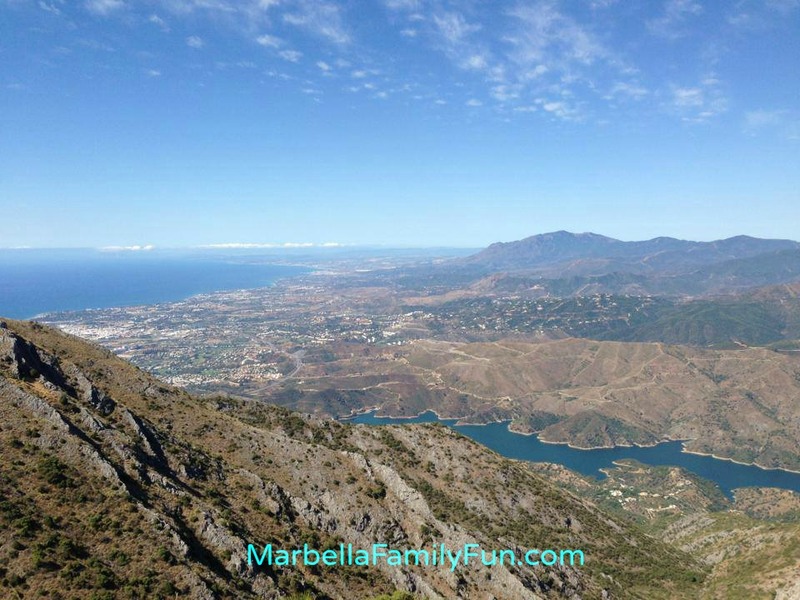 Climbing La Concha, Marbella's most famous mountain, can be started from Istan just 15 minutes from Puerto Banus. How to get there: Coming from Marbella, take the highway A-7 and the exit 176. Then follow the road MA-427 to Istan and the hotel Altos de Istan. Parking: You can leave the car next to the hotel Altos de Istan. Mom's evaluation: Climbing La Concha mountain from Istan is much harder than the trek from the Juanar side. There is hardly any clear path, loads of bushes that scrape your legs, plenty of rock climbing parts where you need to grab with your hands and pull yourself up, and I believe it is slightly longer...or maybe that is just my impression. Nevertheless, I enjoyed my trek and found it quite challenging. I would only recommend this hike for children aged 13 and older and for those that have a relatively higher fitness level. We climbed La Concha as a family and my 13 year-old son managed very well without a complaint other than a bit of boredom towards the end, because we had some people in our group going slower than he would have liked. My 10 year-old daughter, on the other hand, did not enjoy it as much. I have to say that I am extremely proud of her and knowing now what the path is like I would have said she could never do it. She really impressed me. She had a good pace the first 3 hours, but that last hour there was a lot of complaining...tired, too many bees, which freaked her out, loads of scratches, hands were hurting, thirsty, bored, and basically just wanted to get to the top. Once we got to the top it was really exhilarating The view was breathtaking and we were all so proud of ourselves after such a difficult trek. We had a little picnic at the top and rested for about half an hour before our descent. Going down was not any easier than going up. Actually, it felt a bit harder. There were plenty of rocks that made the path slippery, so you really had to concentrate on where you were stepping. Again, my daughter was great for the first few hours, but the last hour was dreadful. Tears were streaming down her face towards the end and she vowed to never go hiking again. I am still extremely proud of her. Because our hike was in June, we decided to start climbing around 8:00am, which was a good idea since Marbella was already seeing very hot days. We managed to have the first few hours completely in the shade, because the sun had not passed to this side of the mountain. We got to the top at around noon, and started our descent around 12:30 arriving to the bottom at 4:30 - 5:00ish. Another member of our party, whom I am really proud of is our dog. He is a small to medium sized mutt and I was doubting he would be able to climb the rocky part where we had to use our hands to pull ourselves over. He managed like a star and got up better than anyone else. This hike can also be extremely fun for your dog, if you have one. How often does your dog get to go outdoors for 8 hours at a time? Overall climbing La Concha is a great experience, but I would much sooner recommend taking the hike from the Juanar side if you have children. It is very important to bring sunscreen and plenty of water (enough for your dog too) as well as a couple of bits of first aid in case anyone scrapes themselves or has a minor injury. It is also very important that you go climbing La Concha with someone who knows the route, because it is very easy to get lost. Before hiking, I read an article about a 66 year old man who got lost (and luckily found later) on the mountain. I have read similar articles in the local paper frequently. The Citizens Security delegation has stressed once again that anyone who wishes to visit this beautiful mountain zone should take the necessary precautions: wearing adequate clothing, taking enough water and a mobile phone with charged batteries. In case of emergency, you should contact emergency services by calling 112 and stay in one place until you are found." Son's evaluation: When we went to La Concha it was fun in the beginning. We got to climb on rocks and hike, but later on it got boring and my body started to hurt. It wasn't as fun as it usually would be because my sister and other people were holding us back a lot. Dad's evaluation: This is a great hike if you want to sweat a little. It takes about 5 hours back and forth. The path is narrow, and not always well marked so you need to pay attention. There are no really tricky or dangerous spots, but a few places are unpleasant because of plants scratching your legs if you wear shorts. Mom: At 8.30am 15 adults, 20 children (aged 11 - 16), 4 guides and 2 dogs left El Refugio del Juanar to start the trek to La Concha (from Juanar). As we were such a large group, of varying abilities, it was decided that we would make a stop every 30 minutes so that we could all stay together to some degree. The first part of the walk took us up a wide track flanked by pretty olive trees and then into a shaded pine forest which gently zig-zagged upwards. After a brief water break we began a more demanding climb with with some loose stones and narrow paths until we reached the base of La Cruce, the smaller peak, we were again out in the open, this part had taken us about 1 hour. The next 30 minutes was quite easy, on mostly level paths with some gentle inclines, already the views were amazing. As we proceeded there were some challenging areas, first a tricky descent down, some walkers had to use their hands to steady themselves, then along a narrow path with a steep drop to the right, up the other side and then along a ridge. The trickiest bit was to come, a steep climb down 2 metres with the need for hands, then a narrow ledge that required some care which all walkers managed without issue! Another hours trek across a ridge, a small descent and then the final ascent to the La Concha peak and it was so worth it, the views were breathtaking, it had taken us 4 hours with stops. After a bite to eat, some water and photos we began our return trip. There were more up hill sections than I had expected and after 3 hours we were back at the cars. A great walk achievable by most people of reasonable fitness. I have done this walk before with my family and it took us 5 hours, my husband had also completed the round trip in 3 hours, so as you can see, depending on the level of fitness will determine the time it could take you.